Little Miss Sadie will be turning 3 on the 8th of September. We are going to have a party for her this weekend while Dylan's parents are visiting. 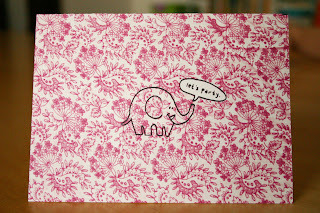 Dylan whipped up this invitation with his own adorable elephant illustration. Love it! 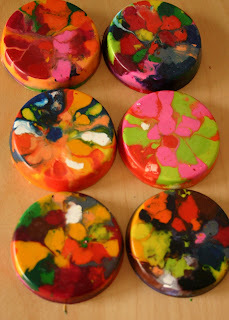 We've been making some recycled crayons as favors for the goody bags. I've got plans for some fun decorations which will include a few of these lovelies & a cutie cute cake idea as well. It's been fun to think about this party where she's actually old enough to have a real party just for her. Those are 2 awesome ideas! I can't wait for the opportunity to do them! Cute ideas! I love Dylan's invitation. I knew you were gonna do the Martha pom poms before I clicked. I like your rendition of the recycled crayons...they are so colorful. Cute party favor idea. Sadie will have a blast I'm sure...wish we could be there. you are THE cutest mom! Such great ideas! I want to find some cute ideas for Scoty's 1st in Oct. But not to go overboard...because he will never remember! I am excited for Miss Sadie, she is way too cute! yea! I love kid's parties! AND we really love Sadie! I hope you all have the best time! Great ideas, Candace. ooohhh we love making crazy crayons! my girls love coloring with them because they don't know what color will be on the paper next! !